The subscription business model is booming and could be considerably bigger in the coming years, so investors need to sit up and take notice. We tend to think of subscriptions in terms of newspapers, magazines, gym memberships and pay-TV services. You could argue that utility bills and mobile phone contracts are also types of subscription even though they are deemed as non-discretionary spending. Business-to-consumer subscription businesses attracted more than 11m subscribers in the US in 2017, according to Harvard Business Review, and the industry as a whole has been growing at 200% annually since 2011. There are now thousands of consumer-focused subscription businesses tailoring products and services to the diverse requirements and preferences of millions of customers. To give you a sense of the scale, Netflix has more than 130m people worldwide paying monthly fees to access its vast and often exclusive library of TV and film content. Sky (SKY), about to be taken over by US media giant Comcast, has something like 8m UK subscribers. Amazon reported having more than 100m people signed up to its Prime service at the start of this year, which gives users access to its own exclusive TV and film content and next-day delivery on thousands of items purchased through its online store. Supermarkets are trying to get in on the game such as encouraging customers to sign up for monthly or annual delivery plans to lower the cost of home deliveries. It is not just consumers either; increasingly businesses are buying goods or services via subscriptions, most typically seen via software-as-a-service (also known as SaaS). While the subscription model is hardly new, the ability to embrace the internet means we may be at the early stages of something far more transformational. It could be more disruptive even than the adoption of personal computers in the 1980s and 1990s, or artificial intelligence and the connected world of the internet of things (IoT) that grab so many headlines today, according to analysts at Gartner. The underlying premise is that almost anything could eventually be sold on an as-a-service basis. For example, think about transport-as-a-service, where we are starting to see car sharing schemes as a real alternative to owning a car yourself. It might even be healthcare-as-a-service, data-as-a-service or a thousand other ‘as-a-service’ subscription options. If it can work for Harry’s with razor blades and shaving cream, it can probably work for anything. Subscription models go down well with investors because of their repeatable and predictable income streams which are normally referred to as recurring revenue. Customers build up familiarity with a service and can often be psychologically reluctant to move to another provider. In some cases, a subscription service can become so embedded in an end user’s own operating model that it becomes almost impossible to switch away. There’s also the promise of networking effects, where a service becomes more valuable to users as overall users grow. Facebook is perhaps the best example of this situation in that the more of your friends and family use the platform, the more you are likely to use it to socialise with them. Analysts at stockbroker Peel Hunt says subscriptions also end up as customer retention tools too, in that if the subscriber cancels, they stop getting the service. Equally important is what service providers can learn about their customers, gaining valuable usage insight on which extra or premium services might be sold. This last point is really important when it comes to understanding the future profitability potential of a subscription business. 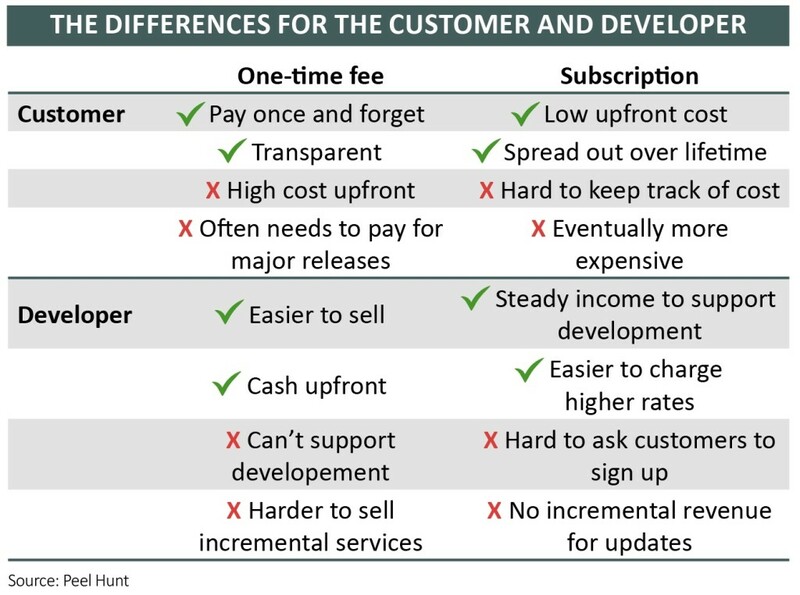 Market research commissioned by cloud computing business Zuora last year suggests that something like 70% of subscription businesses prioritise a customer land grab, with little effort put into customer retention (circa 20%) or upselling existing users (10%) and increasing annual revenue per user, or ARPU as it is known. This is at odds with research findings that show upselling additional services to the existing subscriber base is, by far, the most effective way to generate extra revenue. With no customer acquisition costs (you already have them) subscription models can deliver what Peel Hunt calls ‘add-on creep’. This means pushing incremental features or products, perhaps for free at first, and then slowly turn subscription taps later on. It also has advantages for buyers, making relatively small payments on a regular basis rather than in a large upfront chunk. That takes a lot of pressure off a user’s own cash flow, moving the purchase from capital cost into everyday operating expenses. Putting that situation into an everyday context, a Netflix subscription of £7.99 a month will seem to many ordinary people as incidental – it is effectively the same price as a cheap cinema ticket or a pie and a pint. But how different would you feel being asked to cough up nearly £100 upfront? Most of us get paid monthly and £7.99 is easier to manage than £100 gone in month one. It’s not a one-way street; there is the cost of attracting new customers to think about (marketing cost, for example), customer churn (users that drop a service) and other factors. But it is not really surprising that some of the UK market’s most highly-rated businesses are, at least in part, on this subscriptions ‘as-a-service’ curve. Think Rightmove (RMV), Auto Trader (AUTO) or cyber security specialist Sophos (SOPH), for example. Even Rolls-Royce (RR.) sells many of its plane engines at little better than cost to milk the ‘servicing-as-a-service’ profits stream for many years into the future.